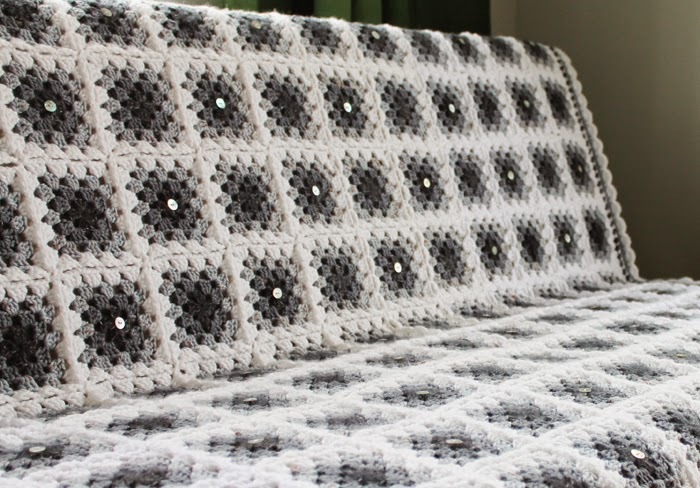 I've finished my Moonlit Night blanket, hooray! It's lovely and soft and snuggly, just in time for winter. Let me tell you a bit about it! 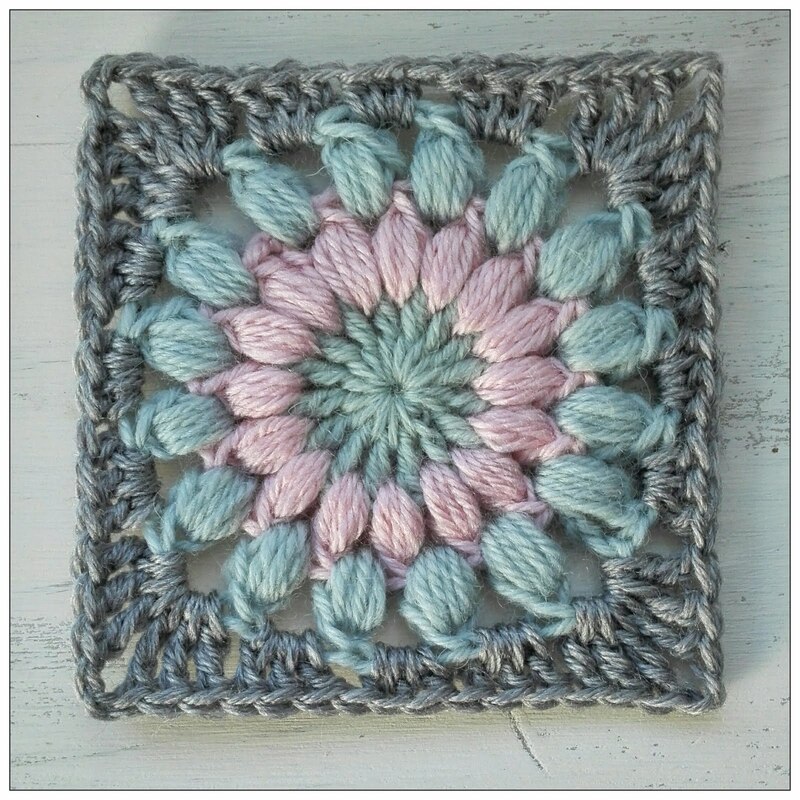 I first had the idea back in 2011 when I was making granny squares for another project. You can read the details on that in this post. I never finished that project though, and actually ended up reusing a lot of the yarn for this blanket! 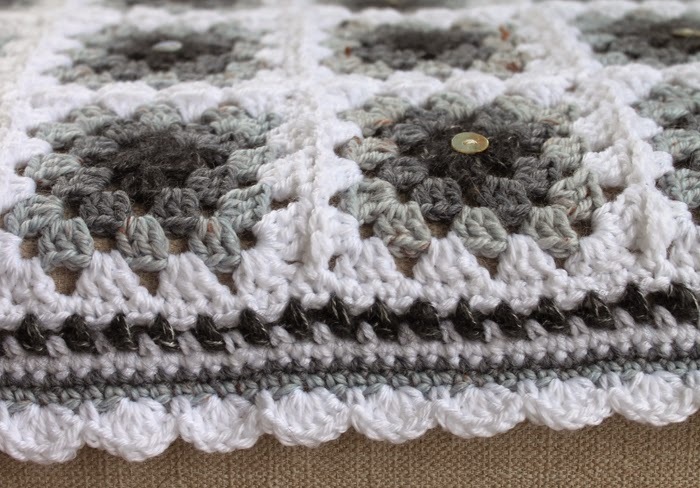 I used three shades of grey yarn and a white. They are all different brands... a fuzzy dark grey for the centre, then a mid-dark grey, then a pale tweedy blue-grey. The white was a super cheap ball of acrylic that wasn't that nice but did I say it was cheap? Important as I used so much of it. 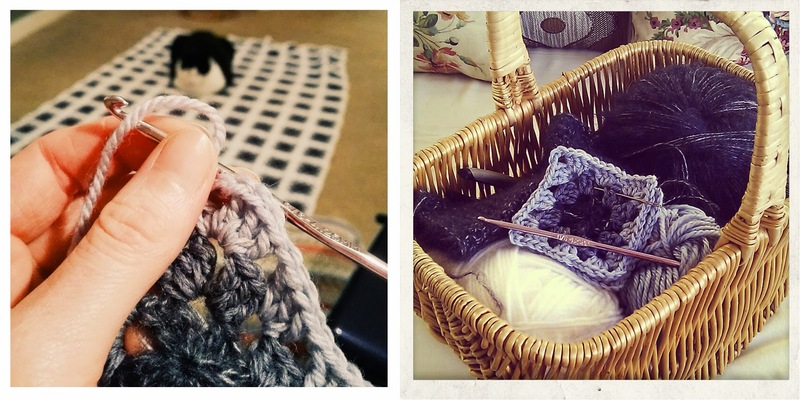 I'm not a yarn snob with my projects, I'd like to be but just can't afford to! The last step, and that which I modestly think sets it above other granny square blankets, was adding mother of pearl buttons to alternate squares. These represent the full moon slipping behind clouds. Also, they are shiny and pretty and really catch the eye when the blanket is draped resplendently over the couch. The blanket is 10 x 15 squares. 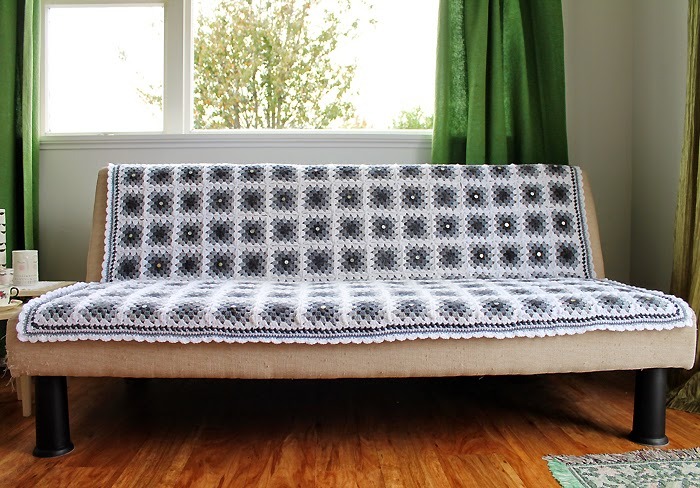 It turned out to be the perfect size for couch-draping! I also congratulate myself because it took less than a year to finish! Ok, eleven months actually. But since my last blanket took two and a half years, I'm happy with that! Here it is in its full glory. I used the join-as-you-go method for joining the squares which saved a heap of time. 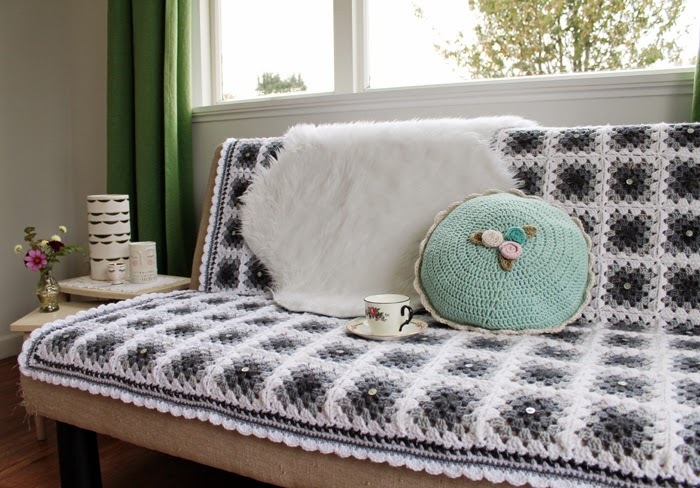 It's great for a blanket like this where you don't have to work out a colour scheme as you go. 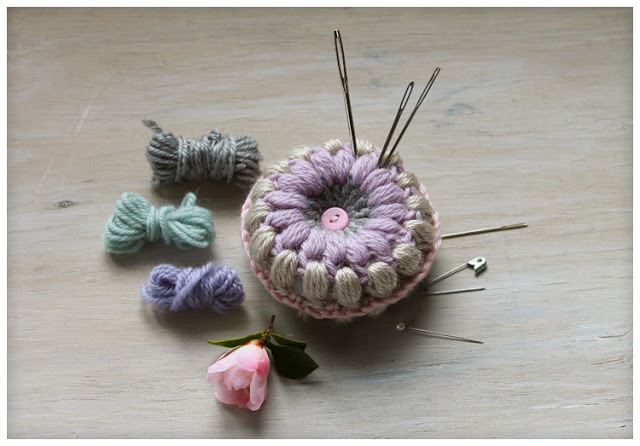 Round 1: SC in white all the way around to even off your granny squares. SC two together where the squares meet. Round 3: in white, 1 sc in ch 1 space, ch 1, skip 2 sc, 1 sc in ch 1 space, repeat all around. Round 4: in white, sc all around. Round 5: in mid grey, sc all around. Round 6: in light grey, sc all around. Round 7: in white, make scallops: 5 dc in one sc, skip 1 sc, 1 sc, 5 dc in 1 sc, repeat. 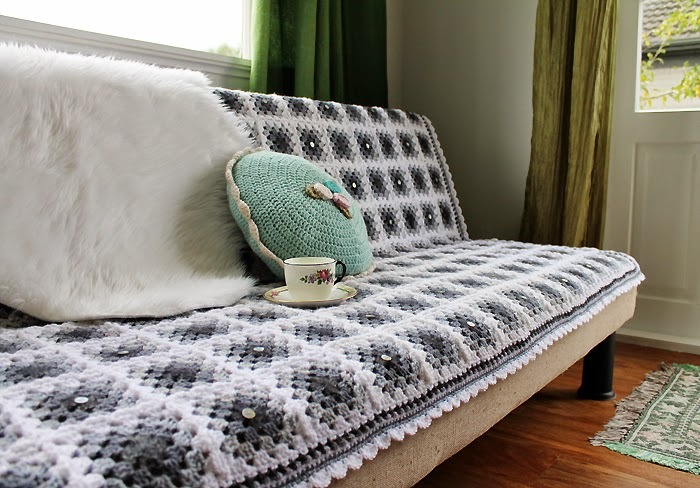 You can also see this project on my Ravelry page. I'm so happy to have this finished but I'm already having withdrawal... the only question is, what to make next? 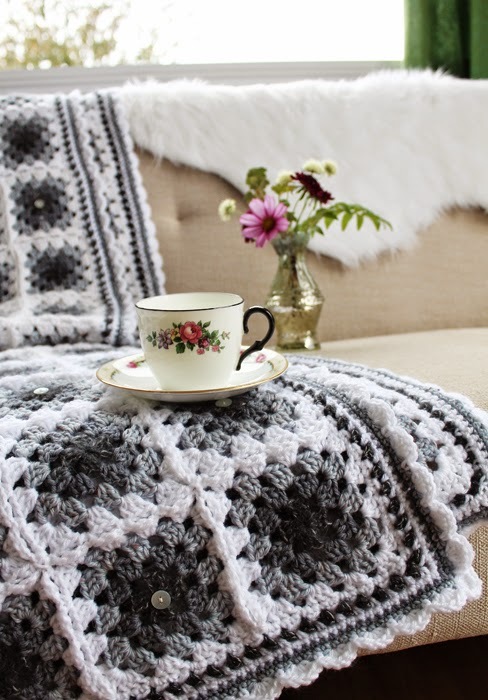 Your blanket is gorgeous Ruth, I love the edging, it's so pretty. I'm impressed - this is beautiful work! I am still at random colour test stage with making an african flower hexagon blanket a good 18months on from idea moment - oh - and random tension issues...I'm looking at the two plus years! LOL! Thank you! Yes, if you count all the time spent planning and finalising the design it always adds a lot! That is half the fun though :) Good luck with your african flower blanket! Thanks Helene, finishing is indeed a huge achievement :) I wish I could say the same about every project I start!